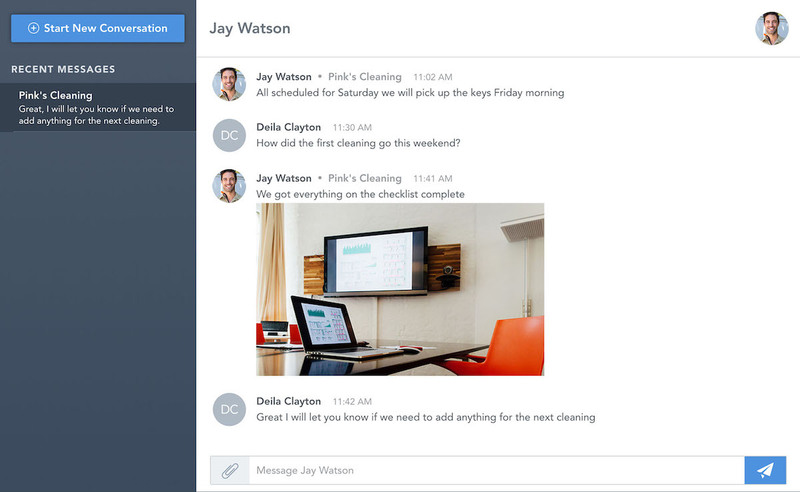 The top-rated office cleaning, IT support, handymen, and more to make it easy to run your workplace. Thank you! One of our account leads will be in contact with you shortly. 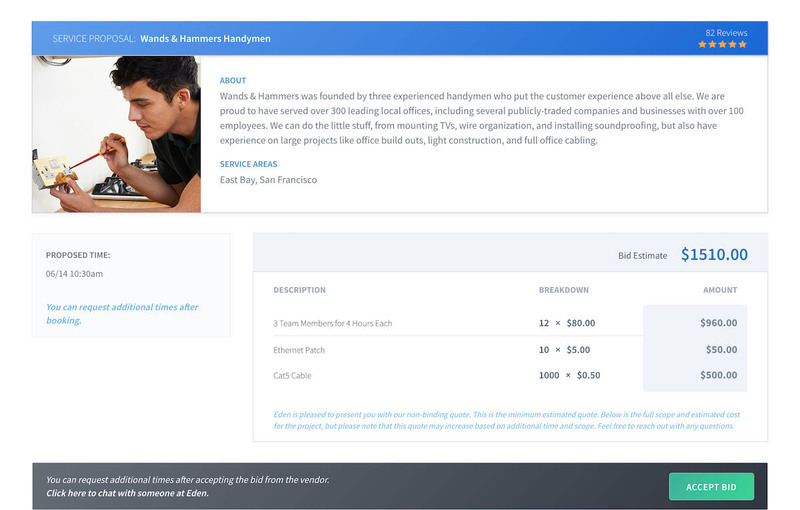 Using Eden’s services marketplace, you can receive multiple bids on any service that you may need to run your office –– handyman work, plumbers, movers, and more. Eden guarantees the outcome you need. All services are covered by our happiness guarantee (and a $1 million insurance policy). You can now chat directly with all of your vendors in your Eden dashboard. All Eden vendors are trained on our suite of operations software, so you can rest assured that their skills are further enhanced by our technology, resulting in optimal performance. 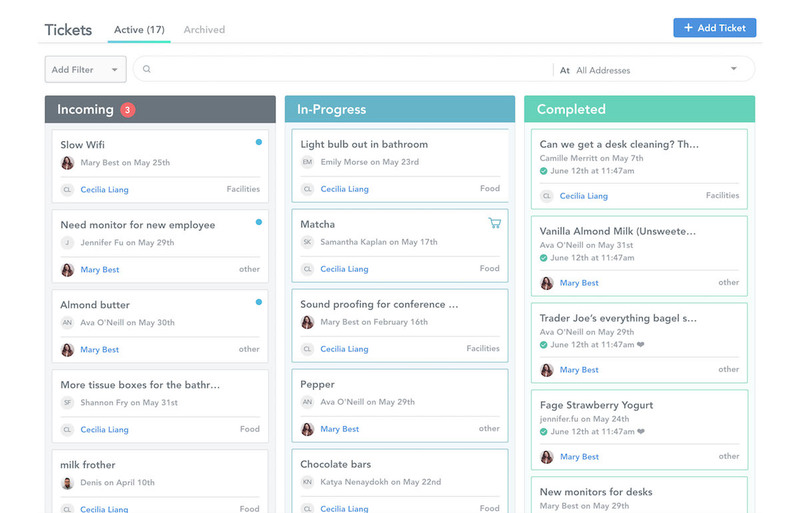 Office managers and workplace teams can now streamline the collection and organization of employee requests. Your team members can submit tickets however is best for your office –– via Slack, website, email, or even our iPad app. No more getting tapped on the shoulder for requests. You can even see analytics around what types of requests are trending in your office, as well as your own request completion turnaround time. We use Eden daily for their amazing cleaning services, and they even managed our entire office move. Eden makes my job a million times easier – I highly recommend them! Eden has been a lifesaver for all types of projects. They've done everything. I know I can always get a quick response when I email my account manager, and I can have a service professional at our office the same day, if needed. The cleaning was AMAZING... By far the best cleaning experience we've ever had. Thanks, Eden! Eden's incredible attention to detail and incredible customer service means you can’t go wrong. My office manager's life is easier, which makes my whole team happier.